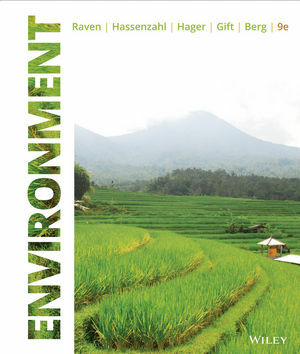 Environment, Ninth Edition weaves the central themes of Systems and Sustainability throughout the text to help students understand the connection between the core concepts of Environmental Science and their daily lives. The 9th edition features a rich collection of current case studies and in-text examples, highlighting local and regional issues which provide students with the science and tools to understand, apply, and think critically about environmental science. It also provides instructors a powerful tools to assess individual students progresses well as the class as a whole. Peter Hamilton Raven FMLS is an American botanist and environmentalist, notable as the longtime director, now President Emeritus, of the Missouri Botanical Garden. David M. Hassenzahl is the author of Environment, 9th Edition, published by Wiley. Mary Catherine Hager is the author of Environment, 9th Edition, published by Wiley. Nancy Y. Gift is the author of Environment, 9th Edition, published by Wiley. Linda R. Berg is the author of Environment, 9th Edition, published by Wiley. Extensive chapter pedagogy that reinforces the systems approach and provides opportunities to think critically about the how these systems intersect and fit together. Enriched critical thinking and more real-world data and graphing opportunities. New emphasis on food production and food security. You Can Make a Difference boxes where students must apply ethical decision making. A focus on Systems and Sustainability highlight how the various aspects of the environment interact, and how changes in one part of the environment might affect other processes, places and organisms. Understanding this is essential to managing existing problems, avoiding future problems and improving the world we live in. Integrated media resources: WileyPLUS Learning Space for Environmental Science gives faculty a significant tool by providing them with a mechanism for motivating students while integrating supplementary resources, including new videos and animations. Well-developed extensive pedagogy offers a clear way for students to move from general concepts to applications of key concepts. In Your Own Backyard feature provides increased opportunities for Critical Thinking and helps students apply the core concept of each chapter to their own lives. Author team offers a varied background. Peter Raven is an internationally respected botanist, environmentalist, world-renowned ecologist and director of the Missouri Botanical Gardens; David Hassenzahl is well-regarded among environmental scientists for his work in risk analysis and is the Founding Dean of the School of Sustainability and the Environment at Chatham University; Linda Berg is an experienced biology/botany educator who has taught both at the two and four-year college level and writer. The 9th edition will have a new co-author, Nancy Gift who is currently Program Chair for Sustainability and Environment Studies: Compton Chair of Sustainability, Associate Professor at Berea College. This collaborative learning environment provides immediate insight into strengths and problem areas through a combination of dynamic course materials and visual reports so that both you and your students can act on what’s most important.